My First Weekend in Puntarenas! I have officially survived and tremendously enjoyed my first week in the beautiful Puntarenas, Costa Rica. My time thus far has been jam packed with traveling, schoolwork, and of course beach time. We first arrived at midnight Friday the 17th, and were greeted by our host families. Costa Ricans, locally referred to as “Ticos,” greet women by hugging and giving you a kiss on the cheek, immediately establishing friendship. My host family consists of my mother Gabriela, her husband Miguel, and her son Jorge. Her husband works in a different city so he is gone a lot, but I am fortunate enough to be able to spend a lot of time with Gabriela and Jorge. When I first arrived at their house, I was offered food and drinks and was given my own bedroom and bathroom. My ethnocentricity led me to believe that everyone everywhere spoke English, so I was very surprised to learn that most people in Puntarenas do not speak English. The mother speaks a little English, but the son speaks quite a bit since he has been taught it for several years in school. I am impressed by both of their English speaking skills, because based on my first semester of college Spanish, it is extremely difficult to learn another language. Jorge was able to translate for his mother and I my first night so that all of my questions were answered. 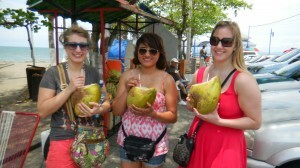 On Sunday we had orientation to learn more about the culture and the city of Puntarenas itself. Some interesting things to know about the city are that women wash their own underwear, sunscreen is about $20 a bottle, shampoo and conditioner are in locked cabinets at stores, men constantly cat call women, they have the coolest soap EVER, and most Ticos follow “Tico Time,” which means most Ticos run about 20-30 minutes late. They also told us about the trips we will be taking with USAC which I am super pumped about. 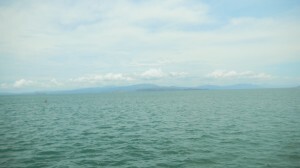 We are going to Tortuga Island and the Monteverde Cloud Forest. Overall I am super stoked to be here and to be immersed in such a wonderful and different culture. There’s lots of world out there!